The Rev. 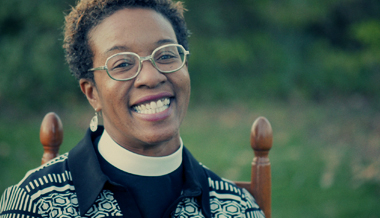 Canon Stephanie Spellers is one of the Episcopal Church’s leading thinkers and consultants around 21st century ministry and mission and is Canon to the Presiding Bishop for Evangelism and Reconciliation. The author of The Episcopal Way (the first volume in the new Church’s Teachings for a Changing World series) and Radical Welcome: Embracing God, The Other and the Spirit of Transformation, she serves as Canon to the Presiding Bishop for Evangelism and Reconciliation. Spellers is responsible for supporting the ministry of the Presiding Bishop and Primate of The Episcopal Church as it pertains to evangelism and reconciliation efforts at the local, congregational, diocesan, and churchwide levels. She also teaches and directs programs in mission, reconciliation and formation at General Theological Seminary in New York City, and serves as a Senior Consultant for the Center for Progressive Renewal, an ecumenical consulting and training group that works nationwide. Stephaine contributes to the Transforming Through Love series HERE. God does not use love like we use love. Stephanie Spellers' thoughts on God's dream. Jesus is God's response to your yearning.